Making cute things is serious business. We pulled out the big guns for the Yo Gabba project by bringing in Emmy Award-winner, Liz Harvatine. Of course, we had to give Liz something more prestigious than an Emmy... 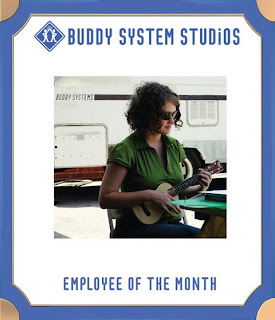 Buddy System's Employee of the Month award! Yo Gabba Gabba! Golden Goose! Congrats to Liz on Emmy win!